I was just wondering if you know that there are so many special ways to let your pet lover friends and your pet lover sweetheart know how much you think of them? This is just one of those ultra-special ways! If your friend or your sweetheart is a dog lover, this would be the best Comment for MySpace and Orkut you can reach out to them with! 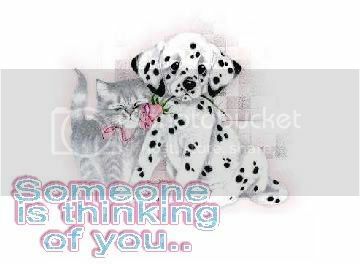 With this beautiful Thinking of you comment let them know how much they are missed.